Two Cent Sam is a relatively new band emerging from the Long Island, NY music scene. They have a unique blend of alternative hard rock and folky indie pop. 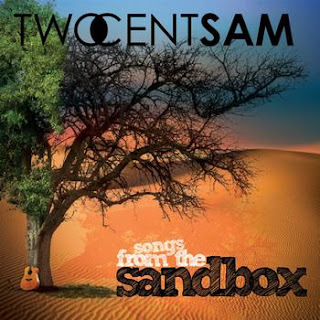 Their most recent release: Songs from the Sandbox is a collection of feel good guitar rock songs about youth and dysfunctional relationships. Lead singer: Mike Logiudice has a knack for unacceptably catchy melodies, the kind Bruce Springsteen wrote during his Born in the U.S.A. period. Radio rock never felt so good. This is what hip trendy bands like The Hold Steady would sound like if the singer was less sarcastic, more honest. Songs from the Sandbox feels like something you’ve heard before, a record you loved in college or the cd you took to the beach last summer. All of the songs are well structured, no filler tracks. It’s a driving album full of classic-cut guitar leads and a super tight rhythm section. Every song stands around three to five minutes. It’s a perfectly built LP without losing the tone from start to finish. Influences range from R.E.M. to The Strokes to new wave pop bands like Squeeze. They know how to write a good hook and they’re not afraid to use it, and sometimes over-use it. Logiudice’s voice is genuine, he sings with the energy of Dave Grohl but the charisma of David Byrne or Tom Verlaine. It’s obvious they have a wide variety of influences as a band, and it all comes together naturally. I would rock this album on a road trip, just the way Bruce Springsteen records make great driving companions, this will too. you nailed it... this album rocks!! Great album an spot on review!